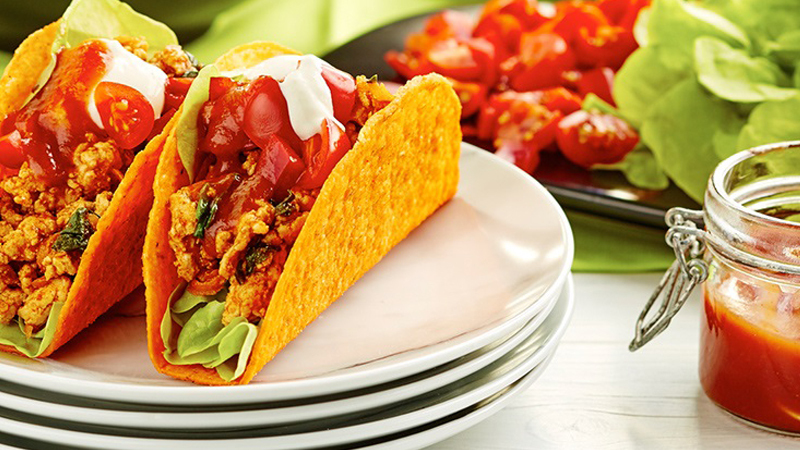 Give your regular chicken tacos a boost with Old El Paso™ Stand ‘N Stuff™ BOLD Nacho Cheese Taco Kit and some zesty lime sour cream! Heat oil in a frying pan over medium heat. Add chicken mince and carrot to pan and fry for 5-6 minutes or until cooked, stirring with a wooden spoon to break up lumps. Add Taco Spice Mix and ¾ cup water. Cook for 2 minutes or stir until thickened. Add spinach, stir until wilted then remove from heat. Combine capsicum and tomatoes together to form a salsa. In a separate bowl, combine lime juice and zest with sour cream.